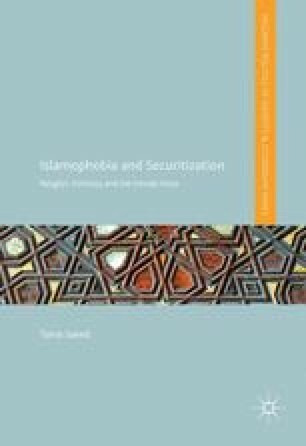 This chapter explores the hyper-securitization of the Muslim Pakistani, illustrating how experiences of Islamophobia differ across Muslim communities, determined by the prevailing security discourse that implicates not just the religious identity, but also different ethnic identities. The chapter focuses on Pakistani Muslim females in Britain, who highlight the phenomenon of ‘Pakophobia’ as a form of Islamophobia experienced at a point when the AfPak problem was at its peak, with the Pakistani identity particularly prominent. The chapter also discusses Pakophobia in relation to student activism in the case of the Justice for the North West 10 (J4NW10) campaign and campaigns for Palestine, revealing how the ethnic connection can be a source of greater vulnerability when placed within a hyper-securitized discourse. Al Jazeera. (06/08/2008) Pakistani doctor faces US trial. AlJazeera. [Online]. Available from: http://www.aljazeera.com/news/americas/2008/08/20088574059161528.html (Accessed 11/10, 2012). Allen, C. (2014) ‘Operation Trojan Horse: examining the ‘Islamic takeover’ of Birmingham schools,’ The Conversation. http://theconversation.com/operation-trojan-horse-examining-the-islamic-takeover-of-birmingham-schools-25764 (Accessed 11/10, 2015). Anthony, A. (23/01/2011) Sayeeda Warsi: A matter of pride and prejudice. The Guardian. [Online]. Available from: http://www.guardian.co.uk/theobserver/2011/jan/23/observer-profile-baroness-warsi-islamophobia (Accessed 08/12, 2011). Cobian, I. and Norton-Taylor, R. (18/05/2010) Two Pakistani students pose ‘serious threat’ but can stay in UK. The Guardian. [Online]. Available from: http://www.guardian.co.uk/uk/2010/may/18/pakistani-students-terror-suspects-deportation (Accessed 06/05, 2011). Havergal, C. (20/10/2015) Visa refusal fears ‘force UK universities out of international markets,’ Times Higher Education. Available from: https://www.timeshighereducation.com/news/visa-refusal-fears-force-uk-universities-out-of-international-markets (Accessed 02/03, 2016). Mason, R. and Sherwood, H. (18/01/2016a) Cameron ‘stigmatising Muslim women’ with English language policy, The Guardian. Available from http://www.theguardian.com/politics/2016/jan/18/david-cameron-stigmatising-muslim-women-learn-english-language-policy (Accessed, 02/20, 2016). Mason, R. and Sherwood, H. (18/01/2016b) Migrant spouses who fail English test may have to leave UK, says Cameron. The Guardian. Available from http://www.theguardian.com/uk-news/2016/jan/18/pm-migrant-spouses-who-fail-english-test-may-have-to-leave-uk (Accessed, 02/20, 2016). Moreau, R. (09/04/2010) Pakistan is the world’s most dangerous country. Newsweek. http://www.newsweek.com/pakistan-worlds-most-dangerous-country-72033 (Accessed 01/03, 2015). Moreau, R. (20/10/2007) Pakistan: The most dangerous? Newsweek. Available from: http://www.newsweek.com/pakistan-most-dangerous-102955 (Accessed 01/03, 2015). Saunders, F.S. (2016) Where on Earth are you. London Review of Books, 38(5), pp. 7–12. Available from: http://www.lrb.co.uk/v38/n05/frances-stonorsaunders/where-on-earth-are-you (Accessed 03/03, 2016). Walsh, D. (24/11/2009) The mystery of Dr Aafia Siddiqui. The Guardian. [Online]. Available from: http://www.guardian.co.uk/world/2009/nov/24/aafia-siddiqui-al-qaida (Accessed 11/10, 2012).